Can’t seem to keep your dreadlocks in “locks?” It’s frustrating when you spend all of that time creating dreadlocks, only for them to fall out just days later. Sure, you can guide the troubled locks back into place, but unless you take a different approach they will likely continue to fall out. What’s Causing My Dreadlocks to Fall Out? There are a number of reasons why your dreadlocks could be falling out, one of which is your hair type. Conventional wisdom should lead you to believe that thin hair is more susceptible to this problem, simply because it doesn’t hold together as easily as thicker hair. Unfortunately, there’s not much you can do to make your hair thicker, other than use a high-quality shampoo and conditioner that’s formulated specifically for people with thin hair. Another possible reason why your dreadlocks are falling out is because they were dreaded too loosely. Regardless of which dreading technique you decide to use, you need to make sure the locks are pulled tight; otherwise, they may fall out when you walk, sleep, run, etc. It’s often difficult to make tight dreadlocks with your own hair, as the awkward angle restricts your range of movement. In cases such as this, it’s best to ask a friend or family member to lend a hand. Alternatively, you can always seek a professional dreadlock service from your local hair dresser or beautician. They will have an easier time accessing your dreadlocks and making them tight enough so they don’t fall out — not easily, at least. Among the most commonly used dreadlocks techniques is the palm rolling method, which is particularly beneficial for instances in which your dreads fall out. Palm rolling differs from the standard twist and backcombing methods in the sense that it requires you to literally roll your dreads in the palm of your hand back and forth. Doing this compresses your hair, making it thicker and less susceptible to falling out. Palm rolling can be done in conjunction with beeswax or some other all-natural thickening/moisturizing agent for maximum benefit. As you roll the dreadlocks in the palm of your hand, it adds a layer of moisturizing conditioner to them, which in turn reduces the risk of them falling out. 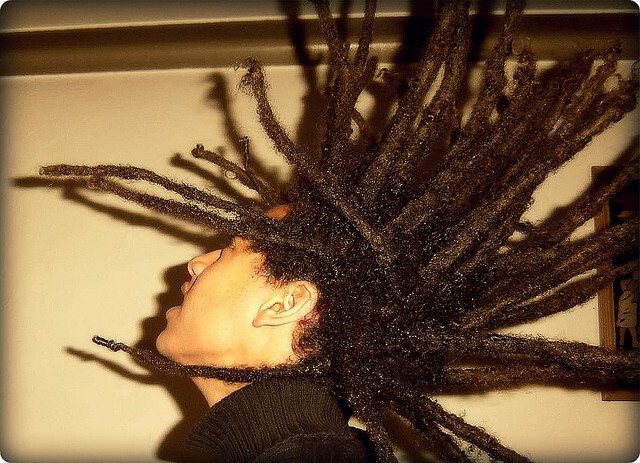 Continue doing this until you’ve covered each and every dreadlock, and you’re done!